Myanmar Juntas say arrests continue (updates via AFP and gulf news): A relentless crackdown on Myanmar's pro-democracy activists showed no sign of easing with the junta announcing on Sunday that 78 more people have been detained in spite of global outrage and new sanctions. These were in addition to 2,093 people who were detained earlier, of which 1,215 were released by Saturday, the paper said. Authorities also took in 533 monks for questioning "to differentiate between real monks and bogus monks." They said 398 monks have been sent back to their monasteries. Dissident groups and foreign governments say more than 6,000 people have been locked up after last month's protests, the biggest in nearly two decades. The government says 10 people, including a Japanese photographer, were killed in the violence. However, independent sources said the death toll is likely in the hundreds. "Day and night, we had to sit in crowded rows with our heads bowed down. If we spoke, looked up or fell asleep, we would be hit," said the monk, who asked not to be named. "We weren't allowed to move it all, not even to go to the lavatory – we had to just do it where we were sitting. Once in the morning, and once in the afternoon, the guards would come and give us water, but it would be only one or two bottles for 50 people or more." Some of the prisoners, he said, had severe wounds sustained during arrest, with cuts and gashes on arms and legs that had gone right through to the bone. Yet despite the filthy, insanitary conditions in which they were being held, no medical treatment was offered whatever. During his time in custody, he claimed, he saw numerous fellow inmates pass out as they sat in the holding area. Three, he believes, died from their injuries. pray for what you cannot see. what you can only faintly grasp. from the core of your being. Anna mentions: "... this prayer touched me deeply. 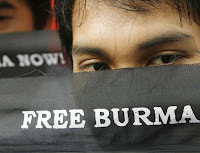 What has been happening in Burma is very disturbing to me. Feeling so helpless, i can only pray for the people of Burma and that the world will respond to their plight, not just to the present crisis but also the systematic oppression of the tribal Burmese that has gone on for so many years and of which, has gone unnoticed for so long."
. "Power of Love might not be enough", says monk who feld Rangoon Terror. “Politics is not the concern of the monks but this time we saw the people getting poorer and poorer and their trouble get bigger and bigger. We thought the monks could negotiate between the regime and the people and show loving kindness to both sides.” - Vida, 48, were among the first monks to escape from Rangoon. MEANWHILE our totally hypocrite, so called 'big powers' and international authorities are still busy with their STUPID sanction gameplay, childish debates in lame security council and fruitless UN drafts of condemnation! ... big question remains, Can this extra-ordinary saffron revolution bring peoples' right and democracy in Myanmar?